Today I found out South African earthworms can grow as large as 22 feet long, with the average length being about 6 feet long. The largest one ever found so far, being 22 feet long, was found on a road side in 1967. 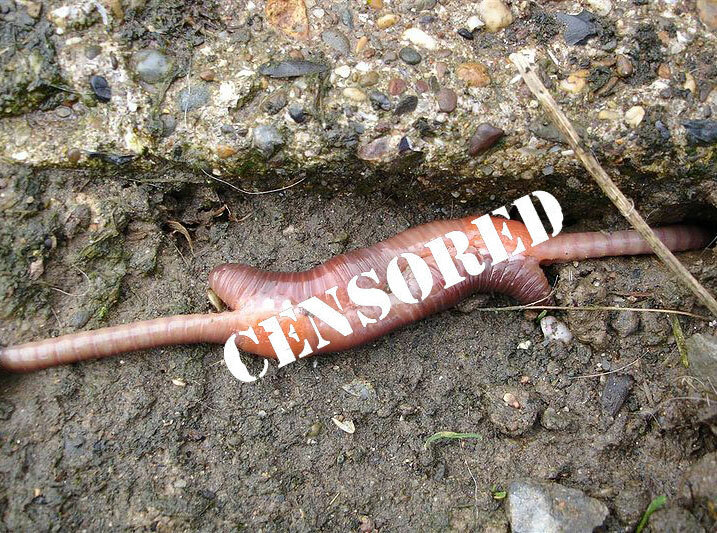 Other varieties of large earthworms include the Giant Gippsland earthworm of Australia, which grows about 3 feet long, but can stretch up to 12 feet and weigh as much as 1.5 pounds. These almost never surface. However, on Australian farms that have this worm, you can hear gurgling sounds coming from the ground as they move through the soil, processing about 1/2 to 1 times their body weight in dead organic material per day. There also used to be a variety of earthworm in Washington State that grew to an average length of two feet long, but this type of worm hasn’t been spotted since 1978. Just south of Washington, in Oregon, there is a species of earthworm that grows to about 3 feet long and, if you handle it, will give off a strong smell of lilies. It has not been spotted since around 1980. Another fascinating earthworm is a variety found in New Zealand, the North Auckland Worm, which typically grows about 4-5 feet long and glows; with several of them around, you’ll supposedly have enough light to read by in the dark. According to research done at the Rothamsted Experimental Station, depending on soil quality, there can be anywhere from 250,000-1.75 million earthworms per acre of land. Poor quality soil will have closer to the 250,000 range; good quality soil, such as farm land, will have closer to the 1.75 million worms per acre. This means that on an average farm with livestock, the weight of the worms beneath the surface of the land will likely outweigh the livestock that walk on top. What makes this more incredible is that a typical garden variety of earthworm can process about 10 pounds of organic material per worm per year. That’s a lot of free enriched soil. Fossil evidence shows that earthworm-like creatures have been around for at least a half a billion years, surviving the mass extinction of animals about 65 million years ago that finished off the dinosaurs, among others. Earthworms can consume about 1/2 to 1 times their body weight every day. They also will eat just about any dead organic matter along with processing a variety of garbage and even tiny rocks that have organic matter on them, grinding the rocks into a paste that will enrich the soil. They are quite literally nature’s garbage disposals. They also force air through the underground tunnels they create, thereby aerating the soil as they work. In the process of doing all this, they process and enrich the soil; they aren’t just nature’s garbage disposals, but also natural gardeners. A good variety of earthworm to use for processing your daily garbage is the “Red Wiggler”. They will eat about half their body weight in a day, so for every pound of red wigglers you have, they will process about 1/2 pound of your garbage a day, producing extremely rich soil in the process for you to use in your garden. As a general rule of thumb, if it comes from something living or in other words, is any way made up of organic material or has organic material on it, the earthworms will process it. As one worm farmer noted “They will eat any organic material, including cotton jeans, shirts, and even my wife’s old nightgown, which they went through in about 4 days.” After they are done consuming an old pair of jeans, all that will be left is the zipper and button. Earthworms not only work tirelessly throughout their lives cultivating and fertilizing soil for plants to grow, but also form the basis of many food chains. They are a staple for many types of birds, snakes, moles, hedgehogs, beetles, snails, slugs and also are eaten by a variety of mammals such as foxes, bears, etc. providing essential nutrients to those animals. Charles Darwin went so far as to say of earthworms, “It may be doubted whether there are many other animals which have played so important a part in the history of the world, as have these lowly organized creatures.” He believed that earthworms are wholly responsible for the top layer of rich soil on the Earth. Darwin also noted the amazing ability of earthworms to bury things in the soil, even entire buildings as they gradually process soil underneath and around the buildings having it sink deeper and deeper over time. They are also quite efficient at burying and processing small things like coins and random bits of garbage, which they will literally grab and pull below the surface where they can safely process it. As you might imagine, it takes a lot of worms to continually cultivate the planet and provide the bases of an awful lot of food chains. Some varieties of earthworms can live up to 50 years (more typically 1-2 years as it’s a hazardous existence being the bottom of a food chain), with most species having a maximum life span of about 4-8 years. To compensate for this hazardous existence and the need for a lot of them to cultivate the earth, they reproduce very quickly, with a freshly hatched worm being ready to breed within about 6-9 weeks of coming out of its cocoon. They can re-produce about once a month, with one worm being able to produce several offspring in one go. Not only this, but earthworms are hermaphrodites. So when two worms mate, both worms produce children. The worms mate by getting in more or less a 69 position, exchanging sperm with one another. Much later, a cocoon is then secreted by the clitellum band, which is visible near the front of the worm. This is roughly ring shaped. As it’s sliding out of the secreted ring, the worm deposits its eggs and the other worm’s sperm into the ring. The ring then seals itself once the worm is completely out. Eventually, the baby earthworms emerge, lacking only the ability to breed at this point, but otherwise fully developed and ready to go process some soil and be the staple of a lot of animal’s diets. How long it takes for them to emerge from the cocoon depends completely on the environment. The cocoon can keep for years without hatching, if the environment isn’t right, or can hatch quite quickly if it’s a nice dry environment. One cocoon will typically produce 1-5 worms. There are about 6000 species of earthworms known, of which about 120 species are widely distributed around the world. Earthworms are able to regenerate most lost segments of their bodies, though this varies somewhat from species to species and the extent of the damage to themselves. In 1972, it was proven that some species of earthworm are able to regenerate to the extent that you can grow two living worms from one bisected worm. However, this is not common among most earthworm species; with most, the side with the head is the only one that survives, assuming the damage isn’t too extreme. Earthworms use a gizzard instead of teeth to grind up their food, small rocks, random non-organic garbage, and other materials. Even though earthworms need to breath, they have no lungs. They acquire oxygen through their skin. This is why earthworms surface after heavy rains, even though it is extremely hazardous for them to do so. If they don’t though, they will suffocate and die. The heavy water content of the soil after rain doesn’t allow gases to diffuse across their skin. Most varieties of earthworms cannot handle direct sunlight for long. This is for two reason; first, because they can’t allow the mucus on their skin to dry out or they will suffocate; second, because most also can’t handle direct exposure to UV rays for more than a few minutes to an hour. If they are exposed to UV light too long, they will become paralyzed and die quite quickly. Earthworms have no eyes, but they can sense light, particularly on their front end. They use this sense to make sure they avoid light as much as possible. There have been earthworms that have been discovered as much as 2 miles below the surface of the Earth. Down there temperatures can reach as high as 160 degrees Fahrenheit. The last Ice Age, where glaciers traveled across North America about 10,000 years ago, also had the negative effect of scraping off most of the top layer of soil. 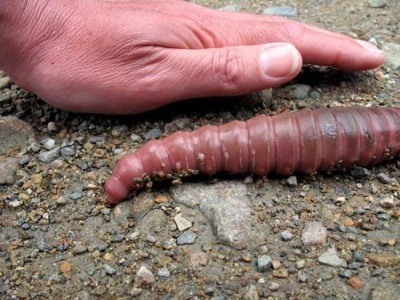 This killed off the earthworm population in the United States and Canada. Earthworms were re-introduced in North America by European settlers, from potted plants they brought. As the settlers moved west, they brought the worms with them. In the 200 or so years since North America was fully settled by these worms, they have almost completely populated North America, creating some of the richest soil in the world in the process. About 370 million worms are exported from Canada alone every year. These worms have a gross export value of about 13 million dollars and a retail value of about 54 million dollars. Your bonus fact on the ice age makes it sound as if there are no native earthworms in North America, which is not true. While native earthworm populations may have been wiped out from northern areas, there remained populations south of the extent of glaciation, some of which could expand their range after glaciation was over. The many interesting species (including one with bioluminescence) of native earthworms are affected by some of the more aggressive species which are primarily the successful colonizing invasive species.